I love reviewing anti-aging skin products as I want to keep my skin young looking. When I choose to review an anti- aging product, I look for ingredients that are know to help with those fine lines. Retinol cream is an ingredient that is know to be great for fighting those fine lines on the face. 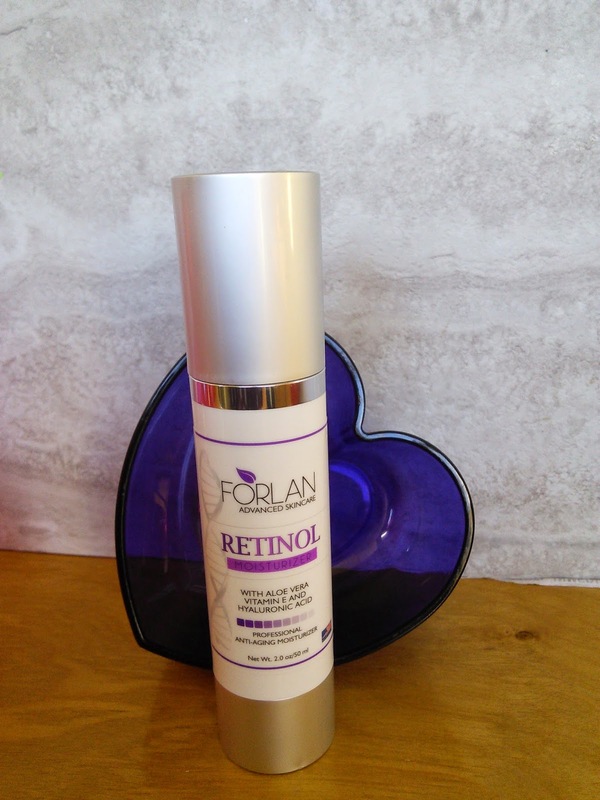 Forlan Skincare Retinol Cream contains a professional grade of Retinol and other natural ingredients to give a specifically formulated anti aging moisturizer that helps reduce the appearance of fine lines and wrinkles. These natural ingredients like aloe vera, jojoba oil, rose water, and sunflower oil help make the skin appear younger, softer, and smoother. The ingredients have a powerful combination of antioxidants (vitamins A,C, B5, and E ) to help fight premature aging and promote softness and elasticity in the face skin. I love that the cream comes an airless, light proof pump dispenser that makes it easy to dispense. This also protects the light sensitive Retinol making it more effective. The cream has a pleasant light scent and makes my skin feel soft. When used over time, Retinol will help make those fine lines less noticeable and keep your skin looking young. I have been using Retinol products for about 7 years and it has helped my skin stay young looking. I am almost 50 years old but thanks to anti-aging products like these that contain Retinol, I don't look it. I have a special offer for my readers to save $5.00 off their purchase of Forlan Skincare Retinol Cream. Just use the code GET5MORE in the promotional code section of your Amazon order. Check out Forlan Skincare Retinol Cream on these links to obtain more information. Thanks for sharing! You look amazing!!! You skin looks wonderful. I am always looking for good skin care products to help with anti-aging. I will have to check this one out. Thanks for the coupon code too!!!! You're looking good, girlfriend! :) Thanks for sharing this great product! Thanks for the promo code! I'm not loving what aging is doing to my skin! Looks like a great product!!! Also, saving money is great, so thanks for that!! I'm definitely always looking for new anti-aging products. Thanks for the discount code! Looks great and looks like it works really well!! I look for products that have retinol in them more now,since the wrinkles are coming! thanks for the code and info on the product. Great coupon, cool product, thanks for posting. This product has all the great ingredients! I bet it does wonders for the skin! Thanks for sharing your thoughts on it and the coupon for it! I only recently started using anti-aging products, so this is good info for me. My eyes are starting to show some fine lines. Oh, fine lines, they are showing up on my face too. I love trying new products, so thanks for sharing your honest review of Forlan.